Dallas Tigers Central Teams have a few rosters spots available for the 2019 spring season! If you are interested in a private tryout please contact coach directly to set up a workout! Dallas Tigers Ahearne 14u AAA/Major will be expanding our roster for the 2019 season. This team has experienced tremendous success over the past few seasons. Last year 13u, they finished with a 41-16-1 record, won 6 1st place tournaments, ranked 3rd in state and 18th nationally. Coach Ahearne is looking for top players that want player development and competition at the high level. If interested in trying out for this club please contact Coach Ahearne at 214-402-7092 or email pkahearne@gmail.com. Pitchers have seen a 3-7+ miles per hour improvement!!! We are happy to announce that 90% of all our boot campers had an increase in top and average velocity. There will not be another Pitching/Throwing Velocity Training Program in the DFW area that compares to what this camp will do for you as a player. There is a reason this throwing velocity boot camp program has been around for the past 11 years, with over 150+ college/professional alumni. A series of 4 to 6-week intense arm care, preventative injury training programs for pitchers and non pitchers who want to take their game to the next level! Charles King – TCU – PG All-American, 126th top prospect 2015 in nation. Tyler Ivey – 3rd round Houston Astros – Grayson CC. The 8u Tigers – Benson won the ASE tournament in Burleson this weekend. The boys went 5-0 outscoring opponents 49-8 winning the 17 team tournament and their first Rings. The Dallas Tigers 11U-Hecht come out of the gates running with a win in the Valentines Day at Big League Dreams (BLD) in Mansfield, TX. Great start boys! 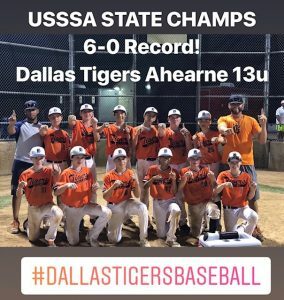 Dallas Tigers 12U team coached by Kyle Woods were able to take home a championship in the USSSA Season Opener played in Celina, TX. The team went 4-0-1 on the weekend. Congratulations boys! Great start to the season. Congratulations to the 15U Dallas Tigers Woods for winning the Perfect Game 25 NTX Qualifier. The team’s bats caught fire after 43 hits in 4 games outscoring their opponents 44 to 3. Congrats on another Championship win! Congratulations to the Dallas Tigers Vanlandingham for winning the 2013 TSL World Series in Waco Texas. Vanlandingham’s boys beat the Texas Blackhawks 7-0. Way to go boys! The 12U Dallas Tigers took home the Perfect Game BCS National Championship this weekend in Ft Myers, FL. There were some tough battles throughout the tournament with Ringgold Georgia, Banditos, Team Mizuno, and SIII Hustlers. In the end, the little things were the difference to win the finals. This group of boys has been in national championship final games each of the last 3 years (AABC, Super Series, and Triple Crown), but this time they were able to come away with a victory. Nice work boys! First of many to come.